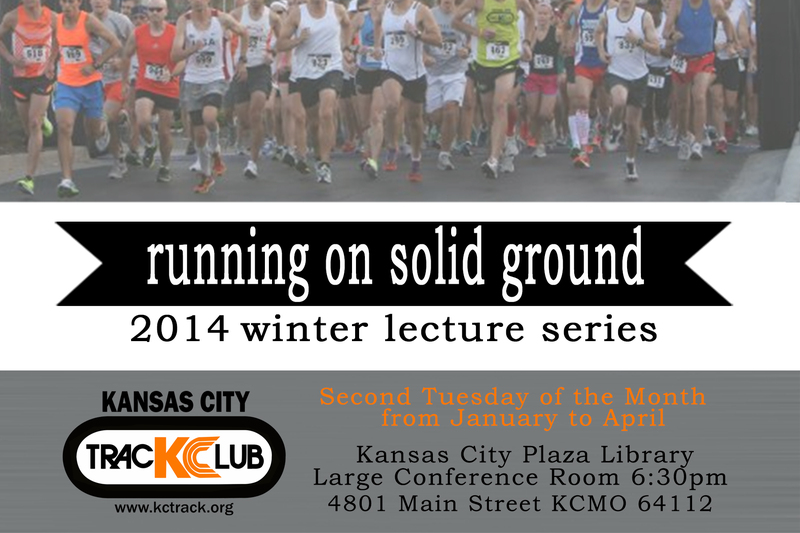 The Kansas City Track Club (KCTC) presents “Running on Solid Ground,” a series of four clinics this winter/spring to improve your fitness during the inclement weather. The clinics are on the first Tuesday evening of the month from January to April with the first three events at Kansas City Plaza Library’s (4801 Main Street, Kansas City, MO 64112) Large Conference Room from 6:30-7:30 PM with a social following each event at Spin Pizza (4950 Main St, Kansas City, MO 64112) which has graciously offered a 10% discount on food immediately following the event. The last clinic is at Shawnee Mission East High School Track (75th and Mission). KCTC with the support of Garry Gribble’s Running Sports will raffle apparel and gift certificates at each program. Clinics are free and open to the public. January 7th, “Endurance Athlete Diet Concepts” by Dr. Jeff Remsburg, DC, will discuss nutrition with a focus on high fat and leaky gut considerations in endurance athletes. February 4th, “Putting the Right Shoe on the Right Foot” by Eric Hunt who discusses the proper running shoe, and Dr. Tom Cotter, DC will discuss minimalist shoes and custom orthotics. March 4th, “Train Your Brain” a Kansas City sports psychologist will discuss mental training for your next event or training session. April 1st, “Dynamic Warm-up” by Angie M. Gutierrez, PT, DPT will lead participants learning a proper, dynamic warm up at Shawnee Mission East High School.